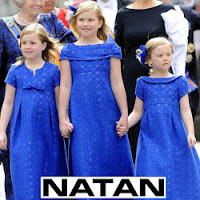 Queen Mathilde of Belgium DHS (born Mathilde Marie Christiane Ghislaine d'Udekem d'Acoz on 20 January 1973). Queen Mathilde was granted the title of Princess of Belgium upon her marriage to H.R.H. King Philippe of Belgium on 4th December 1999. The announcement of Mathilde's engagement to the Belgian heir-apparent Prince Philippe came as a surprise to the country. Mathilde married Philippe on 4 December 1999 in Brussels, civilly at the Brussels Town Hall and religiously at the Cathedral of Saint Michel and Saint Gudula. Mathilde's bridal gown was designed by Edouard Vermeulen. She was made Princess of Belgium on 8 November 1999. 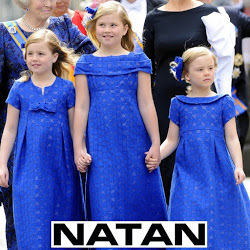 The couple have four children: On 25th October 2001, Queen Mathilde gave birth to a daughter, Princess Elisabeth, on 20th August 2003 to a son, Prince Gabriel, and on 4th October 2005 to a second son, Prince Emmanuel and on 16th April 2008 to a second daughter, Princess Eléonore.